321 in stock Need More ? Translated from the Ancient Greek. 'About things that are within our power and those that are not. 'Epictetus's Discourses have been the most widely read and influential of all writings of Stoic philosophy, from antiquity onwards. They set out the core ethical principles of Stoicism in a form designed to help people put them into practice and to use them as a basis for leading a good human life. 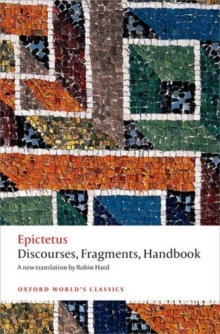 Epictetus was a teacher, and a freed slave, whose discourses have a vivid informality, animated by anecdotes and dialogue. Forceful, direct, and challenging, their central message is that thebasis of happiness is up to us, and that we all have the capacity, through sustained reflection and hard work, of achieving this goal. They still speak eloquently to modern readers seeking meaning in their own lives. This is the only complete modern translation of the Discourses, together with the Handbook or manual of key themes, and surviving fragments. Robin Hard's accurate and accessible translation is accompanied by Christopher Gill's full introduction and comprehensive notes. ABOUT THE SERIES: For over 100 years Oxford World's Classics has made available the widest range of literature from around the globe.